I’ve got a collection of cool movie-inspired poster art for you to check out today from various artists. The posters here pay tribute to films such as Die Hard, Indiana Jones and The Last Crusade, Shaun of the Dead, Hot Fuzz, The World’s End, and Blade Runner. With Christmas just around the corner, maybe some of these posters will make a good gift for some of your movie geek friends. 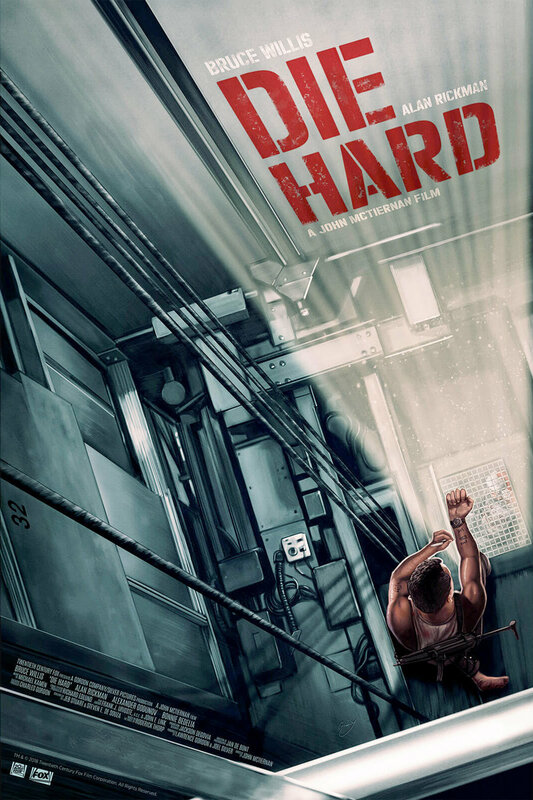 This Die Hard piece comes from artist Sam Gilbey. There’s still a raging debate on if this is actually a Christmas movie or not, but it totally is. The print is currently for sale on Zavvi but it won’t be released until December 24th. Each poster measures 16×24, costs around $38, and will come with a certificate of authenticity from 20th Century Fox. Hans Woody is the creator of this Indiana Jones and The Last Crusade print. I love this film and I can only hope that the fifth one will have this level of adventure and storytelling quality. The poster goes on sale today, December 6th at Bottleneck Gallery for $50. The print measures 24×36 inches, has an edition of 200. “Reflecting back on the movies, they may very well be my favorite trilogy to date. They’ve grown with me, and each movie in the series seems to have been a bit more mature than the last, both in quality and subject, capturing me just at the right time in my own life. I will always love Shaun of the Dead since there is so much nostalgia tied to it, but I love each movie so much, it’s hard to choose a favorite. Each of the prints measure 24×18 inches, have an edition of 225 and cost $45 each. They’ll go on sale at a random time today on Mondo, make sure to follow @MondoNews to find out when. Finally there’s this Blade Runner print from Zi Xu. The art puts the focus on the artificial owl from the Tyrell Corporation. There are two versions of the print. The orange version has an edition of 185 and costs $50 and the blue version has an edition of 90 and costs $60. Both prints measure 24×36 and will be available today, December 6, at 12pm ET at Bottleneck Gallery. Thanks to /Film for the heads up on these!